An industrial garage fan is built to optimize cooling, drying, ventilation and cleaning. These heavy duty fans are built with heavier gauge metals, superior bearings and longer lasting motors, compared to commercial and lighter duty models. Industrial garage fans can achieve higher air flow volumes and greater velocities, making them appropriate for more demanding settings. This includes worksites where excessive water, heat, humidity and other hazards may be present. 1. Airflow velocity – Airflow velocity refers to the speed of the air leaving the fan. It’s a particularly important number for drying, as faster velocities mean more air is pushed over wet surfaces. Industrial garage fans achieve some of the highest airflow velocities, and many can output 2500 fpm (feet per minute) or more. 2. Airflow volume – Airflow volume is measured in cubic feet per minute (cfm) and is important for both drying and cooling. It refers to the amount of air the fan can push out every minute, so greater numbers mean more air for controlling moisture or heat. Airflow velocity and airflow volume vary independently of one another, so some fans offer high speeds and lower volumes, while others push out a lot of volume, but at lower speeds. 3. Speed control – Ideally, an industrial garage fan would come with multiple speeds, as higher velocities are not always desirable. While high speed operation is typically preferred for drying and better cooling, it consumes more power. On some worksites, a lower speed setting can provide efficient and adequate drying and air flow. 4. 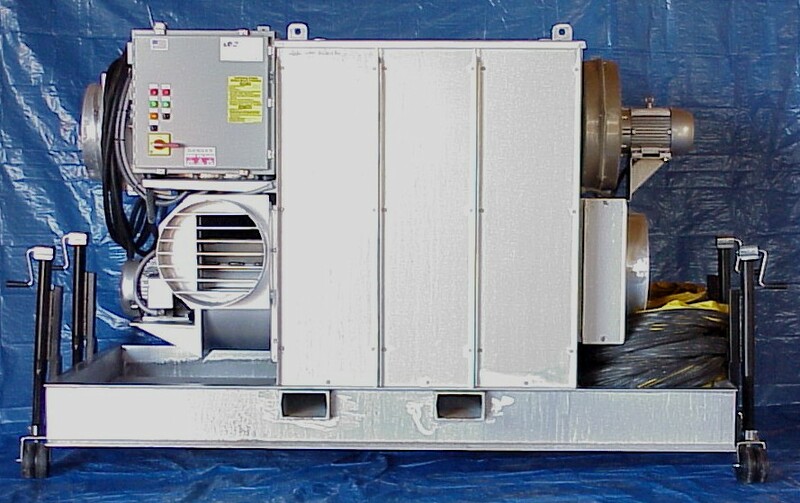 Portability – Some industrial garage fans are designed to be mounted, but many industries require their fans to be portable. A portable fan is more versatile and can go exactly where cooling, drying and ventilation is needed. Even among portable industrial fans, though, some are easier to move and aim than others, and some are stackable, which makes them much easier to store, transport and arrange at the job site. Stackable fans are convenient for drying damaged structures, as they can be paired together for improved airflow. 5. Power features – Advanced power controls should be standard, for both efficiency and safety reasons. An extended power cord is a must, as well as some form of cord management to keep everything organized. An onboard circuit breaker is also valuable, as it keeps the fan safe from damage and reduces trips to the junction box. Some industrial fans also come with a duplex outlet, so additional fans can be daisy chained for even easier power management. This may be critical in buildings where access to power is minimal. Most importantly, the fan should be built with ground-fault circuit interrupter, or GFCI, technology. A GFCI acts quickly to shut off power, in the event that an imbalance is detected between the incoming and outgoing current. It is essential for worksites where the fan’s circuitry could come in contact with water. The GFCI prevents any resulting electrical shock from such an occurrence, and can therefore save a life. 6. Durable construction – Industrial fans are purpose-built, and especially those that are designed to be around water and chemical hazards. These fans are typically made with stainless steel and high quality, lightweight polymers. The polymer housing not only keeps weight down (and portability up), it also protects the fan from corrosion and chemical attack. It also makes for easier cleaning, as the fan can be washed and rinsed off as needed. • Axial fans – Axial fans are easy to spot, as they are built with the same spinning blade technology that’s been around for more than a century. Axial fans are better at pushing high volumes of air, but typically do so at lower speeds and pressures. This makes them ideal for general purpose cooling and ventilation, especially in larger spaces. Some axial fans, though, can operate at speeds comparable to centrifugal fans. These fans are prized for their drying potential, as they combine high velocity and high volume. • Centrifugal fans – Centrifugal fans take in air and speed it up using a fan wheel. This allows the fans to output a directed stream of high speed, high pressure airflow. This makes centrifugal fans the first choice for most water restoration professionals. Because they can be aimed with greater precision, centrifugal fans can be targeted at areas where moisture is likely to collect, such as a room’s corners. Industrial garage fans are the workhorses in any drying, cooling or ventilation effort. They reliably deliver high volumes of air, in a safe and durable package. What is an electronic air cleaner used for? Electronic air cleaners, often referred to as air scrubbers, efficiently remove all manner of air contaminants from a space. Though they can be permanently installed in buildings to maintain air quality, they are often found in the construction and restoration industries. In these settings, air scrubbers are relied on for removing mold, dust, fumes and other airborne contaminants that arise from building damage or construction. When needed in a permanent role, air scrubbers are ideal for medical facilities, as well as manufacturing centers in the computing, pharmaceutical, food and chemical industries. Is a HEPA filter necessary with an electronic air cleaner? Electronic air cleaners vary in their ability to handle airborne contaminants, and in most applications, thorough filtering is a necessary quality. The only sure way to maximize an air scrubber’s cleaning potential is with a HEPA filter. 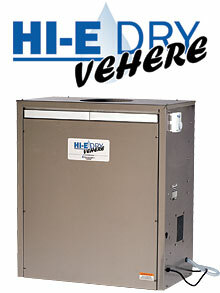 HEPA is considered the industry standard for applications that demand high efficiency filtering. To receive the HEPA mark, a filter must remove from the air at least 99.97 percent of all particles that are 0.3 microns in size or larger. The reason for this metric is that particles around 0.3 microns in size are the most difficult to capture with an air filter. To meet the HEPA standard, the filter must be proven against particles of this size. HEPA filters do not work like an extremely tight sieve, as this would restrict air flow through the air scrubber. Instead, HEPA filters rely on interception and impaction methods to trap particles. In short, a HEPA filter will not adversely affect air flow through a space as it cleans. HEPA filtering should be considered the minimum for any application where airborne pollutants are likely to be a concern. In the restoration industry, for example, water damage is a common scenario. With water damage often comes mold, especially if the water is from a contaminated source, like river flooding. By the time restoration teams have a chance to rescue such a building, mold spores may already have a presence in the air. HEPA filters can remove these spores to limit the extent of the contamination and to protect anyone inside from inhaling the spores and developing health issues from mold exposure. A HEPA filter also offers a safety advantage over filters that rely on ionic or ozone filtration, as HEPA operates using only mechanical forces. This eliminates the likelihood of the filter producing any adverse health effects. When selecting an electronic air cleaner, a true HEPA filter should be part of the package. Be wary of any air scrubber that promises HEPA-Like or HEPA-Type performance, as these are poorly defined standards. To be considered HEPA-Type, the filter should be able to remove 99 percent of all particles 2 microns are larger. Some HEPA-Like filters don’t even deliver that level of performance, but this standard is still inadequate for most demanding applications. Contaminants like insecticides, dust and various pathogens are smaller than 2 microns, so choosing anything other than a true HEPA filter may expose people to harmful conditions. What other features should come with an electronic air cleaner? Electronic air cleaners are usually placed in situations where they need to operate reliably and efficiently. That means an air scrubber that is built to last. If the air cleaner is to be permanently placed in a facility, or at least installed long term, then it should be built from something sturdy like stainless steel, which has the added benefit of resisting corrosion. In the field, mobility is more important in an electronic air cleaner, making metal housing impractical. However, portable air scrubbers should be made from heavy duty polymers that provide strong chemical and water resistance. What else should be prioritized in an electronic air cleaner? 1.The entire air cleaner should be HEPA certified – HEPA filtration, again, is a necessary quality in an air scrubber, but it doesn’t mean much if the cleaner leaks those contaminants back into the environment. In addition to a true HEPA filter, the air scrubber should offer HEPA performance from every part of the system. 2. Mobility – Some air scrubbers are integrated into the building and aren’t going to be moved around much, but most systems should offer some measure of mobility. Air scrubbers that are connected to the building’s ductwork should come with something like a carted design, so the air scrubber can be moved around a site with little effort. Portability is especially important for restoration and construction work, as air filtering needs will change as work crews move to different parts of the building. Portable electronic air cleaners should be light enough for easy carry and should be stackable, so many cleaners can be transported to a worksite at once. 3. Variable speed operation – Some air scrubbers can be operated at different speeds, and this is something that makes sense for many applications. The finer the degree of control over the system, the better. With a larger speed range, users can optimize energy efficiency and filtering efficiency to create a perfect balance between the two. When airborne contamination is a significant problem, high speed operation ensures frequent, rapid cleaning. When contamination is limited, switching to a lower speed setting will save energy while maintaining clean conditions. 4. Delivers power to other devices – Electronic air cleaners are often placed in areas where access to power is either limited or non-existent. In these settings, it helps to have an air scrubber that can run power to other devices. Some portable air cleaners are built with additional outlets to deliver amperage to other equipment. The cleaner should be able to deliver this power while running at its highest speed setting, and the outlet should be GFCI-certified. As portable air cleaners are usually installed in areas where there is water, a GFCI outlet is essential for preventing deadly accidents. Electronic air cleaners do an important job wherever they are used, whether stemming the spread of mold, protecting people from airborne pollutants or keeping manufacturing facilities safe from accidents. It’s essential, then, that you know what to target in a quality system. Why should consumers consider using dehumidifiers at locations such as country clubs, indoor pools, and fitness centers? What benefits do dehumidifiers bring to the table in these locations in particular? These are good questions and not at all uncommon, particularly for those who own or operate such facilities. There seems to be a lot of conversation about dehumidifiers today, and many people know someone who swears by the benefits of these machines. At the same time, almost everyone out there has been in a situation in which they’ve had a problem with excess humidity, whether it’s simple discomfort (a common indoor issue during both the warmer and colder months of the year) or more serious problems, such as an increase in potentially dangerous microorganisms (such as mold and mildew). Insects also thrive in humid conditions (meaning an increase in mites, for example). Humidity poses a variety of challenges. Excess humidity can result in damaged electronics, and flooded areas often require dehumidification so that they don’t develop into health hazards. Day in and day out, humidity seeps into structures in a variety of ways, whether due to everyday activities or the weather or other factors. The trick is to have neither too much nor too little of it, and that’s where dehumidifiers come in. 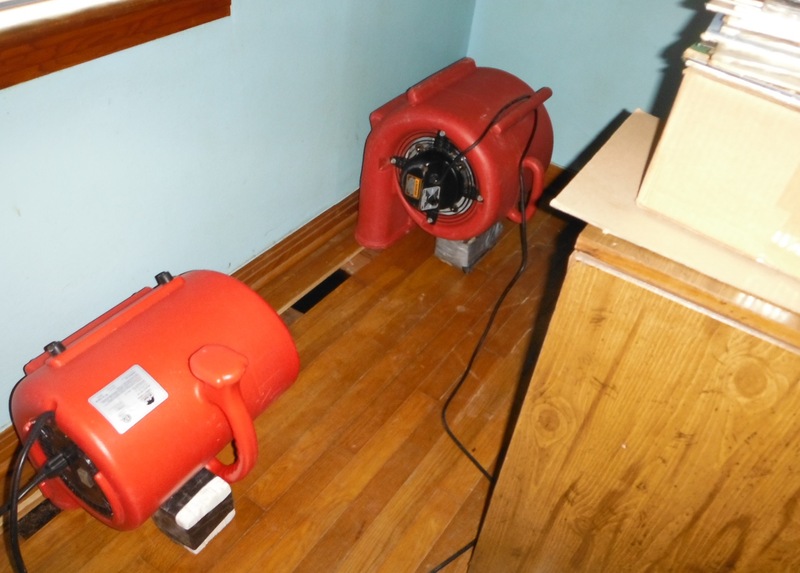 Let’s take a look at a few locations where dehumidifiers may be useful on a regularly basis. Country clubs are a place where club members can congregate and enjoy a variety of activities, from golf to skiing. As a result, it can be difficult to make general statements about country clubs as what they may offer and how they may offer it depends on the club’s location. However, what they have in common is they draw throngs of people who come together to enjoy common activities. Humidity can be a serious problem if left unchecked, particularly during winter. Indoor areas can quickly become humid and stuffy when a large amount of people are present, particularly if their presence involves cooking, swimming, or some other form of moisture. Of course, beyond the health issues, many people find humid indoor locations to be highly uncomfortable. This is particularly an issue for facilities where people go for their leisure time and to be comfortable, such as a country club. With a dehumidifier, country club facilities can control their humidity levels and make sure that their members are enjoying themselves. Many people enjoy indoor pools, and it doesn’t matter what the weather outside is doing. They’re a great place to go and get some exercise or relax. However, indoor pool owners or maintenance crews know that humidity can quickly become a problem. A large body of water means evaporation, which in turn can mean a very significant amount of humidity. In addition, issues with construction can contribute to excessive humidity presence. This humidity can easily reach levels of excess, and beyond the issues of mold and mildew, this humidity often causes foul-smelling air, steam, fogged windows, and premature structural problems. In environments featuring indoor pools, a dehumidifier can make the difference between a moldy, crumbling bowl and a get-away location that everyone enjoys. When designing indoor pools, dehumidifiers must be taken into consideration. Fitness centers are prone to humidity. One of the potential reasons for this is straightforward: fitness centers are often bustling with individuals pushing themselves to their limits, resulting in a combination of sweat and heat. Not only can this constant perspiration result in a humidity increase, but all of the usual issues associated with the poor humidity control in indoor environments may be present, promoting mold and mildew growth and potential structural issues. Fitness centers demand clean and balanced air, and when visitors don’t receive this, they’re likely to complain or actively avoid a facility As with any other location, a properly used dehumidifier means not only increased safety, but also increased comfort for those that frequent the building. No one likes humid conditions. As the air becomes saturated with water vapor, it can feel oppressive, make it difficult to keep cool and make it tough to breathe. Humidity is particularly troublesome for people with respiratory conditions, and it can cause fragile items to deteriorate faster. In short, humidity is a nuisance, and both home and business owners are combatting it with dehumidifying technology. But how do dehumidifiers work, and what is the science behind their operation? Dehumidifiers come in two primary varieties. Thermal condensers are common, and include standard air conditioners, which are found everywhere. Desiccant, or absorptive, dehumidifiers are an emerging technology which can provide relief in settings where thermal condensers aren’t as effective. Let’s go into how each works, and what they can offer a home or business. Thermal condensers operate by manipulating dew point and relative humidity. What, though, are dew point and relative humidity? Dew point is actually what most people think of when they consider humidity. Simply put, it’s the temperature at which water vapor will begin condensing and form dew. The dew point is expressed as a temperature, and usually ranges between 50 degrees Fahrenheit and 80 degrees Fahrenheit. So, for example, if the dew point is at 70 degrees Fahrenheit, then as soon as the ambient air temperature drops to 70 degrees, water in the air will condense at the same rate it evaporates. If the ambient air temperature drops under 70 degrees, water in the air will condense at a faster rate than it evaporates, forming an excess of dew. This is why there is usually a lot of dew on the ground in the morning, when it’s the coolest. Put another way, the dew point refers to the temperature that would result in maximum water vapor saturation. So, if the dew point is 70 degrees Fahrenheit, then at 70 degrees, the air can no longer hold any more water vapor. The dew point is measured by meteorologists using hygrometers. Hygrometers include a metal mirror that cools as air passes over it. Eventually, it cools to the point where water vapor begins condensing on it, and this temperature is the dew point. Using hygrometers, meteorologists can calibrate their humidity instruments and make precise estimates regarding the amount of humidity in the air. Relative humidity is different. Unlike dew point, relative humidity is a ratio, and refers to the amount of water in the air, compared to the amount of water it could hold if the air was fully saturated with water vapor. So, for instance, if the relative humidity is 30 percent, then the air is only holding 30 percent of the water vapor it could hold. Relative humidity is a poor metric to use when determining comfort, as it does not address the actual amount of vapor in the air, and is greatly affected by increases or decreases in temperature. Relative humidity rises quickly as the temperature drops because air becomes denser as it cools. As the air increases in density, there is less room to accommodate water molecules floating in the air, and eventually they have to condense into liquid water once there is no longer any room to fit the water vapor. So, it’s possible for the relative humidity to be high without adversely affecting comfort if the temperature is cool enough outside. At colder temperatures, there just isn’t enough room for water vapor to reach high enough concentrations outside for it to be noticeable. This last concept is the guiding principle behind thermal condensers. 1. A fan pulls in humid ambient air of moderate temperature, and directs it over a series of evaporator coils. 2. The coils, filled with expanded, cold refrigerant, drop the air’s temperature to below its dew point, raising relative humidity beyond its saturation point and causing air vapor to condense rapidly. 3. The condensed vapor is pumped to a drain outside the home or is collected for later removal. 4. The refrigerant is channeled to a compressor that ramps up the pressure and increases it temperature as a result. This refrigerant is pumped to a set of condenser coils. 5. The cold, dry air is then directed over the hot condenser coils, warming it up and increasing its capacity for picking up humidity. This air is then pushed back in to the room to repeat the cycle again. Although the dehumidifier’s components are each a feat of engineering, the overall system is easy to understand and is extremely reliable. Systems that use refrigerant are most efficient in settings where temperature and relative humidity are both high, and in these settings, thermal condensers can quickly remove humidity out of the air. However, at lower relative humidity (usually around 45 percent and below), thermal condensers have to be cooled to such a degree to maintain below dew point temperatures that they can began icing up. In these situations, a desiccant dehumidifier makes more sense, so let’s address how those work next. 1. Humid area is drawn into the desiccant dehumidifier, and pushed across a rotating disc impregnated with silica gel. The disc resembles a bundle of straws through which air can flow, and the silica gel is lined along the inside of these tubes. 2. The silica gel is filled with nano-sized pores, increasing the surface area of the gel exponentially. In fact, a single teaspoon of silica gel has so many pores that its surface area is similar to the surface area of a football field. 3. With so much area to condense on, the kinetic energy threshold separating vapor molecules and condensed water molecules dips greatly, meaning vapor molecules exhibiting less energy will be much more likely to condense. 4. As water collects on the disc, a portion of the air drawn into the dehumidifier is heated and used to recharge the condensation so that it vaporizes again. This air is ducted to the exterior to deposit the water outside and is returned to the building. The remaining dry air is shunted back into the room. Because desiccant dehumidifiers work using chemical properties, they are unaffected by low dew points and relative humidity. This makes them much more efficient in drier settings and they can be used to drop the relative humidity of a space to nearly one percent. However, they aren’t as energy efficient and fast as thermal condensers when the temperature and relative humidity is higher, so many locations use both to complement each other’s strengths and shortcomings. That’s a quick look at the science behind the most common dehumidifiers on the market. Of course, it gets more complicated than that, and the physics involved are fit for a college level class, but what’s important is that both technologies are reliable, easy to control and are extremely effective at doing their jobs. There are many factors that make a great dehumidifier for a water restoration company but many people look for the wrong things. It has always been my thought that I would choose actual performance over marketing hype. However, many people in our industry choose a dehumidifier off of how it looks or how small it is or by information they get from the manufacturer. I would like to see people choose a dehumidifier based on performance, then the manufacturers would be more apt to come up with new technologies. In the article I wrote on my website I give details of the many things I see as crucial when choosing a dehumidifier. First and foremost though has to be choosing a low grain refrigerant (LGR) dehumidifier over a conventional / standard refrigerant. In my opinion, you should not be in the water restoration industry if you are not going to choose good quality equipment. Choosing a standard/conventional dehumidifier instead of an LGR or desiccant dehumidifier is just not very smart. So do us all a favor, if you own a standard / conventional dehumidifier use it for a boat anchor not as a tool to dry a house or business. Once these units are eliminated from the industry the quality of work and speed of work will go up. Dehumidifiers will run for years if they are properly maintained and cared for. It’s not complicated but is often overlooked. By doing a little maintenance from time to time you will not only extend the life of the dehumidifier but you will help keep it functioning at full capacity. First are the filters. The filter in your dehumidifier should be changed often. Just like the filter in your air conditioner unit it needs changing from time to time. This will help keep the coils cleaner and allow you more time in between full cleanings. Then you will eventually need to clean the coils, in the case of a refrigerant unit, or the desiccant material, in the case of a desiccant dehumidifier. Both can be done fairly easily and will help keep the efficiency of the unit high. After all if you own a dehumidifier don’t you want it to function at a high level. Determining dehumidifier requirements on drying jobs can be complicated enough but I would like to talk about one aspect of the puzzle I think is over looked. 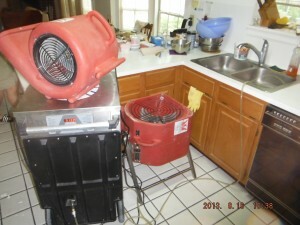 For years we have taken the total cubic footage of an area to be dried and used that to calculate how many dehumidifiers you need for a particular situation. You also need to take into account things like number of people using the space while drying, temperature of the area, and the amount of porous material within the area that is affected. This is all well and good and most drying contractors can calculate this pretty efficiently and quickly. However, do we ever account for the fact that the return air plenum is inside our area to be dried? Say we have a 2500 square foot house with 10 foot ceilings and about a 1000 square foot of the house affected by a fresh water leak. We put up containment on the 1000 square feet area and determine that we need 250 pints of dehumidification to properly dry the 10,000 c.f. However it ends up taking you 5 days to dry the area when it should have taken you 3. Then you realize the air conditioner return plenum for the entire house is in the containment area. So every time the air conditioner kicks on it takes some of your dry air and puts it throughout the entire house. Do you need to account for this in some way? Are adjusters going to understand and approve any extra equipment or extra steps to account for the loss in dry air? Here’s two ways you could handle it. First, figure your dehumidifier requirements on the entire house. 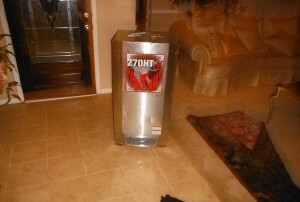 Still put up containment but put all your dehumidifiers inside the contained area. Second only use the required dehumidifiers for the contained area and rig up some kind of ducting from the return air plenum to the containment barrier and pull unaffected air into the return so you don’t loose your contained drying chamber. So how do you handle it? Have you even ever thought about it? We get some unusual calls here at Professional Drying Equipment. Just the other day we got a call from a guy looking to purchase a dehumidifier for a walk-in, fully air conditioned gun safe. Now this thing was big and it was located inside a gun store. The problem was it had high humidity inside the safe during the times of day that it was closed. This was causing some issues with the things inside the safe. We figured out what size and type of dehumidifier would be best for them based on some simple questions we ask. Now the customer is enjoying the benefits of their new dehumidifier. So if you have an odd situation where high humidity is an issue, feel free to give us a call or email and we can help you work through the process of buying the correct dehumidifier for your needs. Drying a wood floor can be very intimidating to most people. However it doesn’t have to be. In Houston we see plenty of wood floors up on screeds and have dried hundreds of them. Over the years we have tried many different techniques but the one we always come back to is demonstrated in the photo to the right. By removing one board on one side of the room and another small one on the opposite side of the room we can force air under the floor and dry the entire floor. 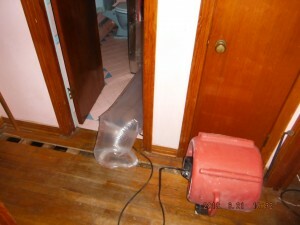 Another thing we like to do is to pump the hot dry air from a dehumidifier under the floor. This could also be done with one of the many heat drying type units on the market today. To do this though you need to have the correct style of air movers. Desiccant, refrigerant, low grain refrigerant, with so many choices for dehumidifiers what makes one a better choice than another? The particular application you plan to use a dehumidifier in, will help to narrow your choices as to which kind and size of dehumidifier you need. Different styles of dehumidifiers operate better in certain conditions and sometimes the size of a project alone can dictate what kind of dehumidifier would be best. For instance, a desiccant dehumidifier can operate in a wide range of temperatures and still be efficient while a refrigerant dehumidifier is most efficient between 70 and 90 degrees. So if you are trying to dry an area that is normally in the 50 degree range a refrigerant style unit would not benefit you. However, a desiccant style unit would still be able to operate efficiently and remove the excess water that you want gone. These style units have an absorbent material that takes the humidity out of the air in the form of a gas. Refrigeration style units will take the humidity out in the form of a liquid and so if it gets to cold in the drying chamber these style units will not function as well and will start to collect ice on their coils. market for a dehumidifier make sure to talk with a someone that can walk you through the process before you purchase some equipment that will not suit your needs. Whether it is desiccant, refrigerant, low grain refrigerant, or just an exhaust fan buying the right equipment the first time can really make a difference.